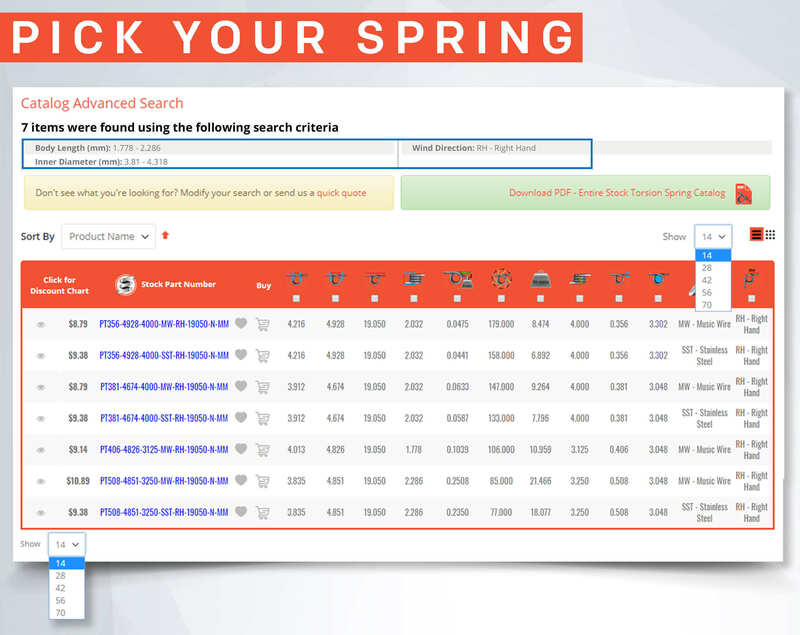 Definition: A spring search engine tool which uses the metric units of measurement to help you find and select the spring with the dimensions closest to what you need. Our metric torsional spring selector, Spring Finder, uses your springs dimensions in metric measurements to locate a stock spring within your tolerances. It is an advanced piece of technology which will point you in the right direction before making a purchase. 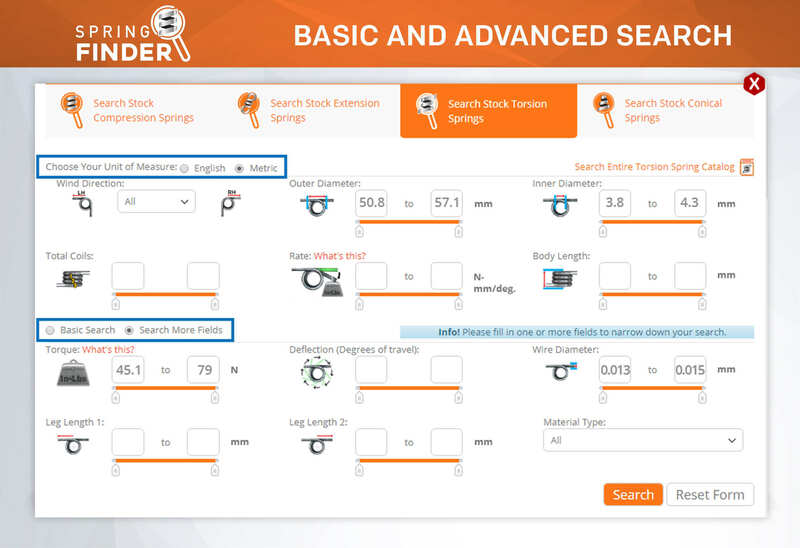 The metric torsion spring finder is automatically set to look for your springs in the english units of measurement but you will see the option at the top right of the finder to change the measurements to metric. The measurement types for the metric torsional springs finder are millimeters (mm) for measurements and newtons (N) for loads. The unit of measurement for metric torsion spring rate is newton-millimeters per degree (N-mm/deg). Using our torsional springs finder, you are able to decide which dimensions you want to input. This means that you don't have to have a full spring design or be a spring expert to find your stock torsional springs. The provided inputs for a basic search are outer diameter, inner diameter, total coils, and rate. If you have more information and want to narrow your search down even more, you may click on "Search More Fields" where you will be provided with more inputs which include torque, deflection (degrees of travel), body length, leg lengths 1 and 2, and wire diameter. You can also narrow your search down even more by selecting a direction of wind or a material type. The material types given are Beryllium Copper, Hard Drawn, Music Wire, Oil Tempered, Phosphor Bronze, Stainless Steel 302, Stainless Steel 17-7, and Chrome Silicon. After you have input the necessary fields and decide to continue with the search, you will be provided with a chart which lists all of the standard torsion springs which meet the the required tolerances you input into the finder. The first column provided in this chart is the metric torsion spring part number. The part number for our torsion springs is made up of all the physical measurements as well as the material type, the type of plating if it is plated, and the unit of measurement the part number was generated with. You will know whether a springs measurements listed in the part number are english or metric because the metric torsion spring part numbers end in "MM" while the english ones end in "IN". The following column list the torsion spring's retail price. Wholesale prices for larger quantities are provided once you click on the part number. The remaining columns list the most important information; your torsional spring's physical dimensions, force, and elasticity tolerances. As far as physical dimensions, you will see all of the information listed in the part number including the additional information like plating and material type. These are tolerances you already set in the spring finder. The important things to look at now are Rate per Degree, Suggested Max. Deflection, and Suggested Max. Torque. These values will help you know if your spring will be able to tolerate the torque you expect and it will also help you calculate if you will be able to meet that torque with the spring rate provided. To calculate your spring's torque you must multiply the spring rate per degree by the degrees of deflection as shown in the formula below.